When Max puts on his wolf suit and makes mischief, his mother calls him 'Wild Thing' and sends him to bed without any supper. 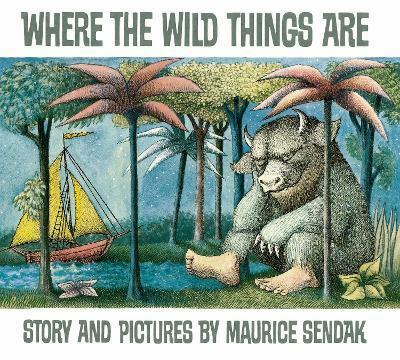 Alone in his room, Max enters a magical world and sets sail across the sea to the place where the wild things are. The wild things roar their terrible roars and gnash their terrible teeth and roll their terrible eyes and show their terrible claws . . . But Max tames the wild things and is made their king. Will he ever want to go home? "A timeless masterpiece. The illustrations, the fabulous monsters, the beautiful cross-hatching, and the surreal, dreamlike narrative beckons the reader to join the adventure. The themes are perfect for inspiring discussion on confronting life's scary things, mastering your fears and being brave, letting off steam, saying goodbye, and the comfort of returning home safe and sound"